Glen Craney's "The Virgin of the Wind Rose" is a mystery-thriller that grips you from the beginning and doesn't let you go until the very end. The story follows Jaqueline Quartermane (Jaq), a lawyer with the State Department, as she searches for answers after stumbling into a mystery that ultimately uncovers deep secrets about Christopher Columbus himself. Having grown up on a farm in eastern Kentucky, the State Department is foreign to the recently hired Jaq, but with perseverance, she manages to catch herself up to speed, quickly learning the lingo and culture of her position. What she lacks in experience, she makes up for with a sharp wit and unyielding determination. "The Virgin of the Wind Rose" opens with a boy exploring a subterranean church in Ethiopia and making a startling discovery related to the biblical Adam. Craney does an excellent job of pushing the story forward by shifting the plot between different time periods and regions, from Yemen to Portual to Washington D.C. and more. Craney manages to weave together history, fiction, and religion with writing that is descriptive yet concise, pulling you deeper into the story with every page. 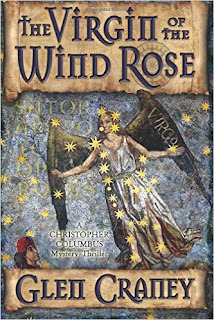 "The Virgin of the Wind Rose" is a must-read for any fan of historical thrillers!